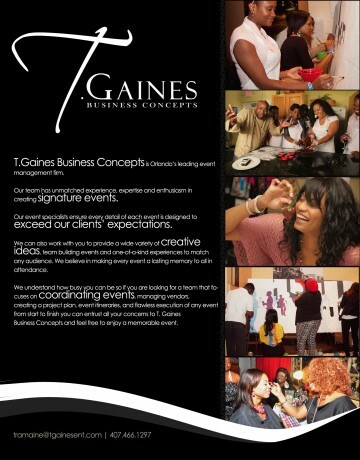 T. Gaines Business Concepts is Orlando’s leading event management firm. Our team has unmatched experience, expertise and enthusiasm in creating signature events. Our event specialists ensure every detail of each event is designed to exceed our clients’ expectations. We can also work with you to provide a wide variety of creative ideas, team building events and one-of-a-kind experiences to match any audience. We believe in making every event a lasting memory to all in attendance. We understand how busy you can be so if you are looking for a team that focuses on coordinating events, managing vendors, creating a project plan, event itineraries and flawless execution of any event from start to finish, you can entrust all your concerns to T. Gaines Business Concepts and feel free to enjoy a memorable event.